Dennis Avery, who funded a variety of endeavors, from prehistoric statues to Stephen Hawking’s cosmology center, was most at home in the Chinese community of San Diego, touching thousands of lives through his philanthropic efforts. Acknowledging his contributions to the Chinese and other Asian communities in San Diego, the Asian Heritage Society will bestow the Diversity Pioneer Award posthumously to Avery during the Tenth Annual Asian Heritage Awards Gala Sept. 14, 2013 at the San Diego Marriott Marquis and Marina, 333 W. Harbor Drive, San Diego. Avery passed away at the age of 71 in 2012. The event will also honor UCSD Chancellor Pradeep Khosla with the Special Recognition Award and 12 others in categories ranging from entrepreneurship to military service. “Many people, organizations and communities would agree that Dennis Avery touched our lives in many forms while he lived -- as role model, coach, mentor and supporter. Many times we fail to appreciate individuals such as Dennis while they are alive because we think they will be with us forever. While Dennis has passed on, this award is our way of keeping his legacy alive,” said Rosalynn Carmen, president of the Asian Heritage Society. 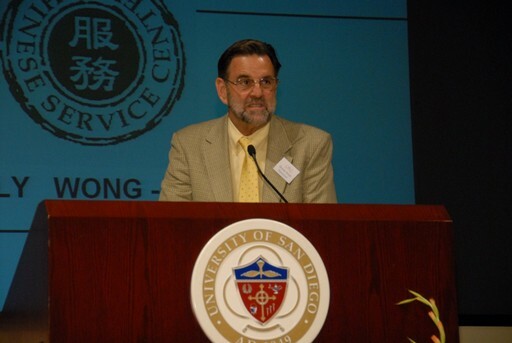 Past Diversity Pioneer Award winners have included Dr. Robert Gish of UCSD, for his work to curtail hepatitis b in Asia; Rear Admiral Ron McLaren, for campaigning to increase the number of Asian Americans in upper echelon ranks of the Navy, and the Habitat for Humanity, for its homebuilding efforts in Southeast Asia. Avery’s father, R. Stanton Avery, founded the family label-making business in 1935. By the turn of the century, the business had 16,000 employees and $3.2 billion in sales. Dennis, however, took another turn, earning a master’s in law from Cambridge University and working in the San Diego City Attorney’s office as a consumer fraud attorney. In the 1980s , while serving as associate dean at Cal Western School of Law in San Diego, he met a law student who was to become his wife and partner in a wide variety of community work for the rest of his life. Together, Dennis and Sally Wong-Avery served in the board of a select number of individuals to travel to China in the early 1980s as part of a first if its kind program called “China Adventure.” Together, they also established the first fully licensed bilingual preschool in San Diego. “It was a long time dream” of her mother, said Natasha Wong. “Dennis loved children and believed in her dream to educate and teach Chinese language and culture,” she added. Avery was known to fund ideas, grandiose and small. Years ago, when property there was literally dirt cheap, he bought some 3,000 acres of undeveloped land in Borrego Springs to keep it from being developed and called it Galleta Meadows, which later became the site of dozens of giant sculptures of the prehistoric animals that once roamed the area. The site has since become a renowned tourist attraction. In 1999, while visiting Stephen Hawking at the University of Cambridge in England, he listened as the world-renowned astronomer shared his concept of a “Newton’s Nest,” where the next Isaac Newton or Albert Einstein might emerge. He liked the idea so much that he and wife Sally wife put up the initial funding for the project. The Centre for Theoretical Cosmology is now a permanent part of Cambridge.